Online banking makes our life easier and convenient, you don’t have to go and wait for the payment center to open or fall in line to pay your bills. We can pay our electricity, water, internet, and other utility bills, including tuition fees in front of our computer anytime anywhere at our convenient time. To take advantage this feature in online banking, you can register for one of the top banks in the Philippines that offers this service. Banco de Oro or BDO online banking can remove all the hassle in your monthly billings. Now, assuming that you have a BDO account, please note that you cannot enroll or register to BDO online banking if you don’t have an account. Step 1. Go to the BDO official website (https://www.bdo.com.ph/) On the top-right corner of the homepage, hover you mouse on the “Online Banking Login” button, then select “Enroll Now” on the menu that appear. Step 2. You will redirected to Terms and Conditions page, after you read and understand the terms and conditions, accept by checking “I have read, fully understood and agreed with the Terms and Conditions” checkbox then click “Submit”. Step 3. 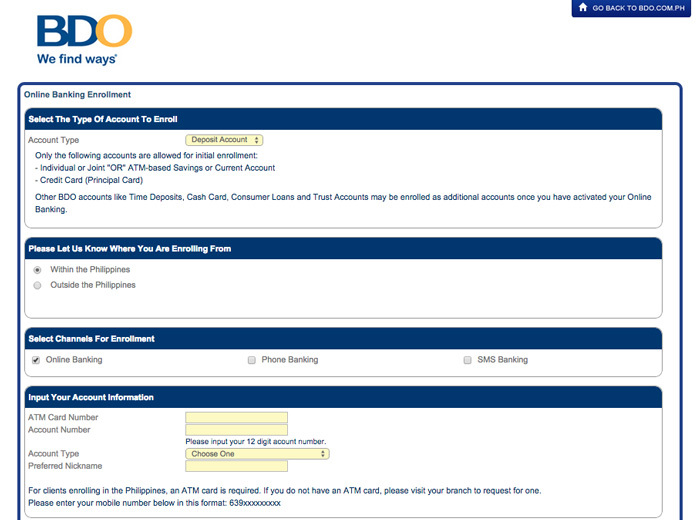 You will arrive to an Online Enrollment page, select account type that you want to enroll, select “Within the Philippines” if you’re in the Philippines then fill out the form completely, make sure to choose a strong password which contains UPPERCASE, lowercase, numbers and symbols and don’t use password same to your user ID. Enter your mobile number to receive SMS notification everytime you login to your account. Remember that this is your money. Step 4. After you completely fill out the form, double check all the details you entered be sure that it is correct then click “Submit” button. Step 5. Take note of your ATM Activation Code found on the acknowledgment page. You will use this for your enrollment activation. Step 6. Go to any BDO ATM. Using your ATM Debit Card, select “Other Services” > “Activate Electronic Banking”, and enter your ATM Activation Code. You may use your BDO Online Banking account after 24 hours from ATM activation. 3. Select “Outside the Philippines” , fill-out the form and click on “Submit”.